Camp Kalahari lies at the edge of the Makgadikgadi Saltpans, a truly unspoilt wilderness area. Camp Kalahari lies at the edge of the Makgadikgadi Saltpans, a truly unspoilt wilderness area. At the centre of the camp there’s a homely lounge and dining area, filled with locally made furniture. A little way away the covered pool is perfect for a cooling swim. Sundowners are served in the open looking towards the reddening palm-fringed horizon. At night the whole camp is lit by lamps and lanterns, which adds to the desert ambiance. The Meru-style canvas tents are set on elevated decks provide comfortable and characterful accommodation complete with wooden campaign furniture and patterned rugs. En-suite facilities are in the form of outdoor shower rooms, open to the sky but screened for privacy, with solar-heated water. Each tent has a small covered veranda. Camp Kalahari is the simplest camp of the three sister camps in the area, but it’s still great quality and offers the same activities as San Camp and Jack’s Camp. All three camps belong to Uncharted Africa. The dry and wet seasons offer opportunities for different activities and experiences at Camp Kalahari. In the dry season (mid-April to October), the lack of water forces wildlife to migrate, leaving the stunning landscape of the Makgadikgadi Pans free to be explored. At this time you set out on drives to get a sense of the vastness of the pans, it’s an awe-inspiring scene. You can also explore on foot, led by a resident guides and local San Bushmen, for a lesson on survival in this apparently harsh, even hostile, setting. In November, with the onset of the rains, life returns to the saltpans, first in the form of vegetation and then birds and animals, especially thousands of zebra and wildebeest. Guests at Camp Kalahari between November and mid-April enjoy exciting game drives. Throughout the year there are chances to spot desert species such as gemsbok, springbok, aardvark and brown hyena, as well as spending time with endearing meerkats. Visit Chapman’s Baobab, thought to be about 5,000 years old. In 2016 this enormous tree fell to the ground, but can still be visited. Quad biking on Ntwetwe Pan in dry season (May-Oct) Please note that helmets are not provided, and this negates your travel insurance. In all conscience we cannot recommend this activity until the health and safety policy of the owner of this lodge changes on this matter. If you have an accident you will not be covered at all. In all other aspects, this lodge is to be highly recommended. The 10 traditional safari tents are equipped with 4-poster beds, with rich textiles adding colour and character. Children of all ages are welcome. There is a family unit, effectively 2 tents with a shared bathroom. Those with children aged 12 and under must book a private vehicle. 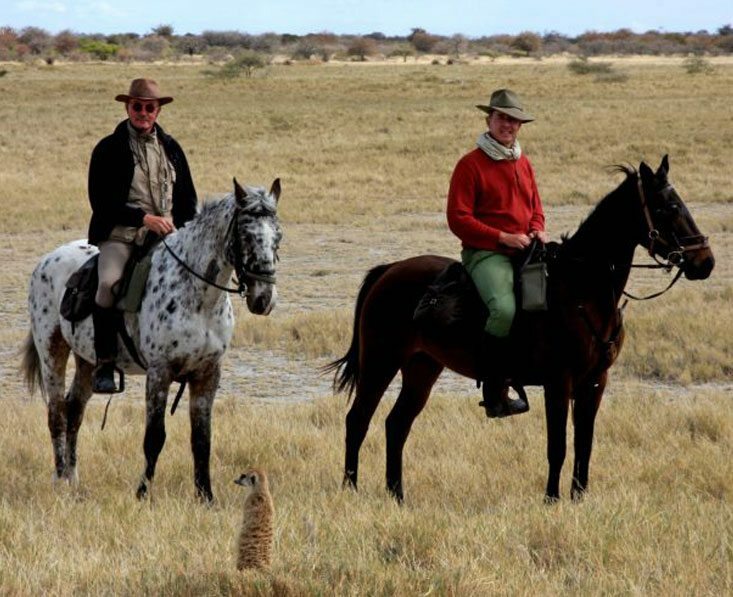 A riding adventure through the Makgadikgadi Salt Pans and a wildlife safari in the Okavango Delta, a special safari experience indeed!